Nike’ marketing pitch: Designed for maximum propulsion. Upper: Thin engineered mesh, internal midfoot strap. Midsole: Compression molded EVA foam with heel Zoom Air and internal midfoot shank. 8 mm heel drop. 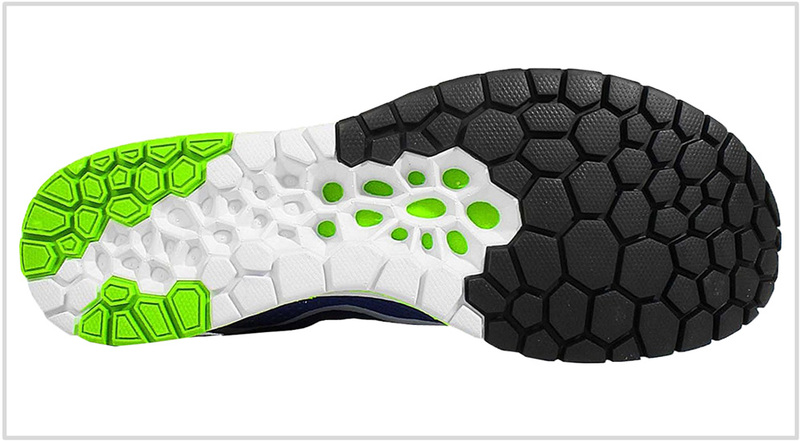 Outsole: Rubber under forefoot and heel, exposed foam under the midfoot. The Streak 6's upper has more forefoot room than the Streak 5, and the internal straps spread the midfoot fit evenly. The ride has improved too, so the only dark spot is the flimsy mesh construction - which is prone to tearing. 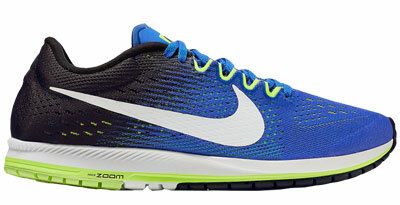 Today, the Nike Zoom Streak 6 is an excellent racing shoe. But one of its pre-release public appearances was a complete PR disaster. Just over a year ago, Eluid Kipchoge won the Berlin Marathon. He ran it in a super-human 2 hours and 4 minutes, a time which most of us can only dream of. As a matter of fact, that running speed also proved too much for the hapless Zoom Streak 6 prototype. Mr. Kipchoge’s blistering pace squeezed the insoles out of the shoes, and the Zoom Streak’s flapping-insoles infamy was good fodder for the next day’s media headlines. Yes, the Streak 6 was that shoe. The Streak 6 redeemed itself in the London Marathon six months later, where Kipchoge (besides winning it) just missed the world record by just a few seconds. This time, the insoles stayed put, though the midsole appeared different than the production version. The retail version of the Streak 6 comes with its insole glued tight. On last year’s Streak 5, the insole was glued to the lasting, but one could yank it off without much effort. There’s a low-calorie version of the Streak 6 called the Streak LT3, a 4 mm heel offset (vs. the Streak 6’s 8 mm) shoe which works great for shorter races. There’s also a Flyknit version of the Streak 6 in the form of the Zoom Flyknit Streak, which happens to have a more relaxed upper than the standard model. 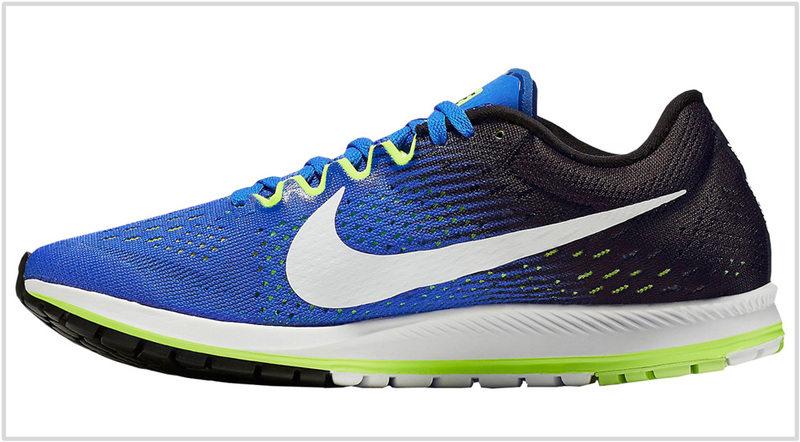 Outside the Streak assortment, you have the cushioned Nike Lunartempo 2 and the Lunaracer 4. And finally, there’s the Flyknit Racer with its first generation Flyknit upper and a firm midsole. 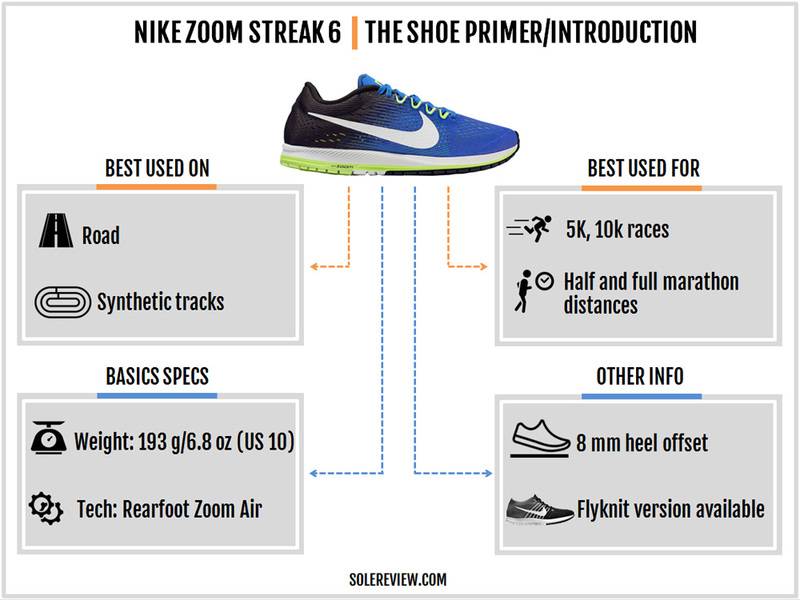 The use case for the Zoom Streak 6 is clearly that of a race-day shoe or the occasional fast training. Daily use isn’t recommended because of its relatively fragile build, and a narrow last shape which is suited to faster paces than an easy run in the park. It’s a great shoe to have as a part of your running shoe arsenal, where a second shoe could take the brunt of daily training while leaving Streak 6 for the fast days. More on this during our rotation breakout. If you’ve been a Zoom Streak 5 owner, then know that the new model is a complete design makeover. Significant updates have been made to both the quality of upper fit and the ride character. The update process increases the Streak’s versatility, making it a handy shoe for anything between 5k races and a 26.2 miler. 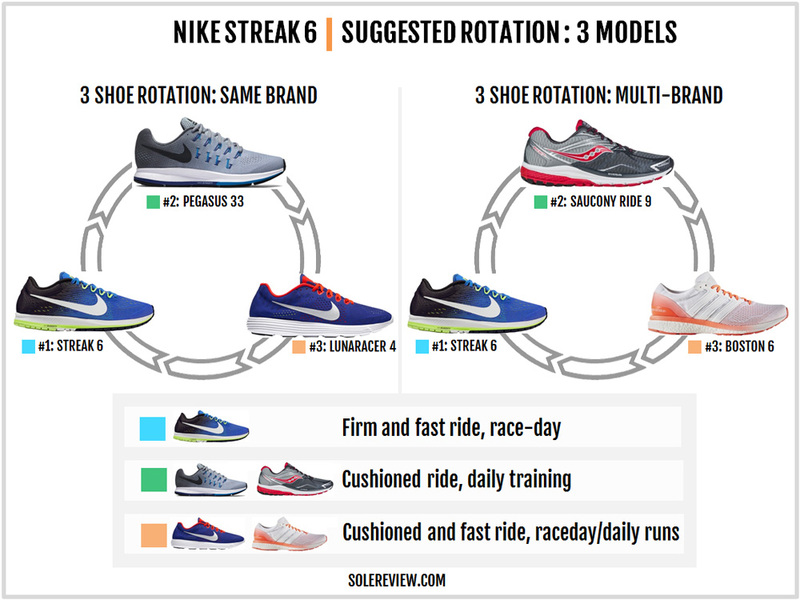 All brands have their versions of ‘fast shoe’ tiers. The similar riding adios Boost 3 competes directly with the Streak 6, and the firmer Hyperion is Brooks’ Streak competitor. The softer riding Hyperspeed 7 is Asics’ Gel infused speed shoe, and superb fitting New Balance 1400 V4 is the Bostonian brand’s race-day staple. Among others, the Mizuno Hitogami 3 blends firm wave-ness with cushioning, and the Type A is Saucony’s interpretation of footwear fastness. Naturally, all these shoes come with their distinct fit quality and ride behavior. But if we had to choose the closest thing to the Streak 6, then it would be the adios 3. The adios 3 Boost has a minimal, but relatively spacious upper (for a race shoe) with a responsive and consistent ride. Wait a second, one might ask. What of the Boston 6 Boost or the Takumi? The way solereview sees it, the Boston Boost goes head-on with the plumper Lunaracer or Lunartempo. On the other hand, the Takumi competes with the more minimal Streak LT3. So that leaves us the semi-racing flat pairing of the Streak 6 and the adios 3. Makes sense? Solereview has never been a fan of Flywire. And we’re not talking about the original Flywire idea which was based on Vectran fibers fused into the upper, but the cord-based one seen on the Streak 5. Flywire cords have the tendency to dig into the sides especially on minimally constructed shoes, making for a less than stellar upper fit. So the fact that the Streak 6 has let go of the cord based lacing is a good thing. In Flywire’s place is a pair of internal midfoot straps with diamond-shaped cuts. Correction, these are more like wide panels which are a part of the outer upper. Right around the laces, the outer upper turns inside to connect with the internal panel. 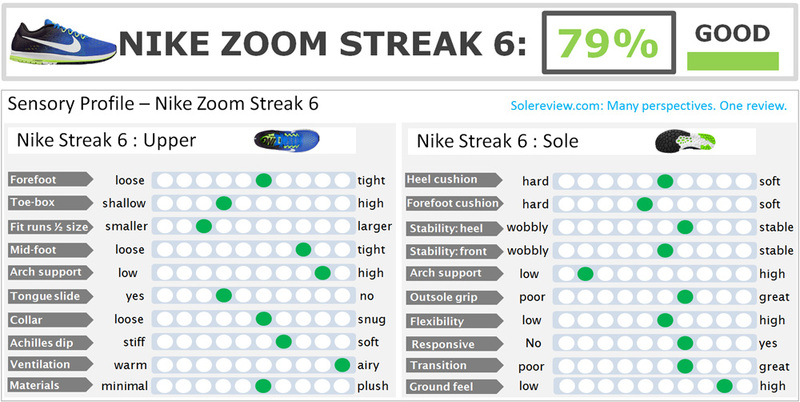 As a result, most of the Zoom Streak 6’s lacing relies on flat speed loops instead of regular eyelets – which are limited to three rows only. 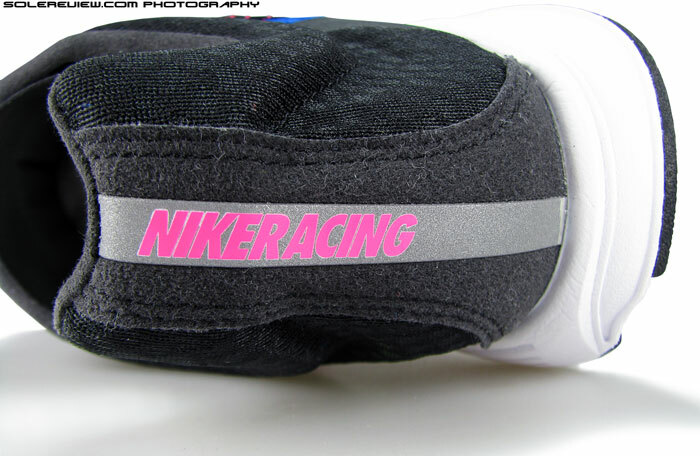 There are other examples of the times (not on the Streak, though) when Nike has used an internal midfoot strap. Among the shoes reviewed here, the 2012 Nike Free 3 run had it, though of a different design. Interestingly, the suede-like material of the Zoom Streak strap with its diamond shaped openings reminds us of the lasting material adidas uses in some of its shoes. The tongue is very minimal in construction. Most of it is built using a thin mesh, and the only reinforcement exists in the form of synthetic overlay right near the flap. This raw edged design is very similar to the Streak 5’s, except that the area of synthetic layering has decreased this year. Even with no sleeve, tongue slide is minimal. 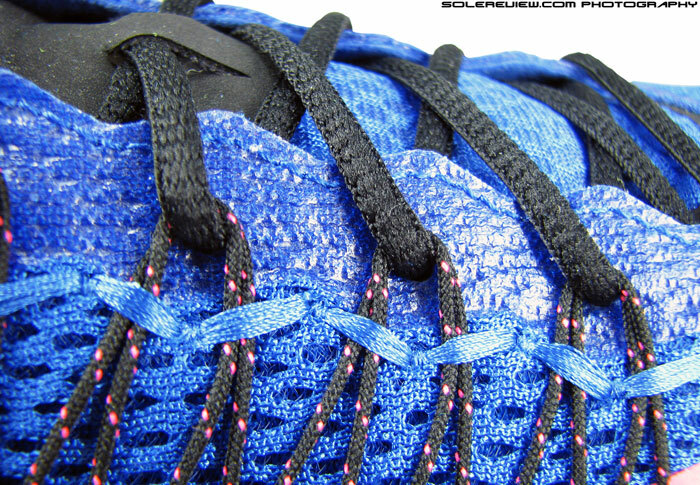 Because of the speed lacing loops, the entire lacing becomes narrower. When combined with the lace-hold loop located on the tongue top, the narrow lacing restricts the extent of slide. Placing the support system inside visually cleans up the outer profile. The aesthetically busy Flywire is gone, and the same goes for the synthetic layering last seen on the Streak 5’s rearfoot. There happened to be a large panel of synthetic suede over the Streak 5 with a reflective insert. All that has been reduced to a thin laminate, which has its pros and cons. On a positive note, the Achilles area is softer, having been freed of thick overlays. The downside is that you’ll be mourning the loss of reflectivity – if dawn or dusk running is your thing. The Streak 6 mesh is brand new. 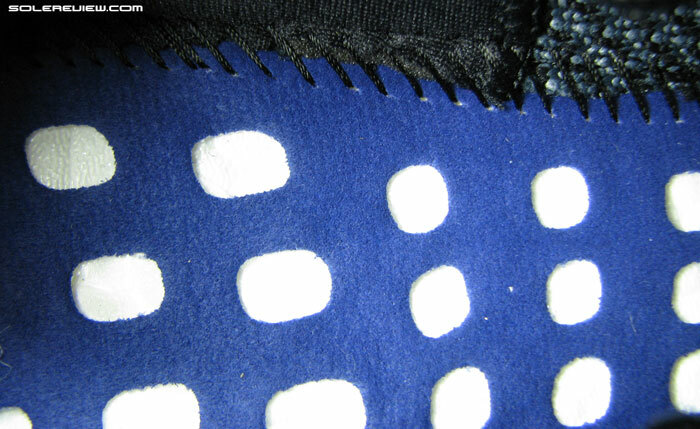 The Streak 5 used a thick spacer mesh – the kind which has some sponginess when you squeeze it. Replacing that is the Streak 6’s thin and flat engineered mesh. While the mesh is tightly knit in some areas such as near the forefoot and heel, most of the surface has an open construction. This update makes the Streak 6 a lot more ventilated than the Streak 5. The biggest change comes in the shape of the forefoot. The Streak 6 widens its forefoot and toe-box, which is a welcome contrast to the pointy front of the Streak 5. 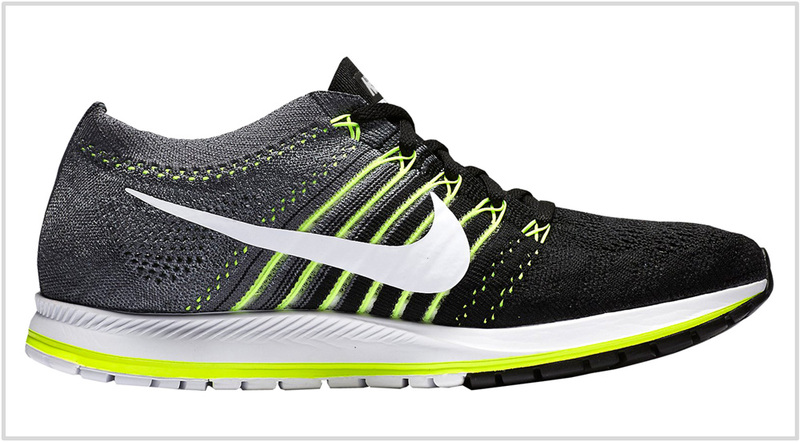 As mentioned earlier, a Flyknit Zoom Streak exists alongside the regular Streak 6. Same midsole and outsole, but coupled with a Flyknit upper. 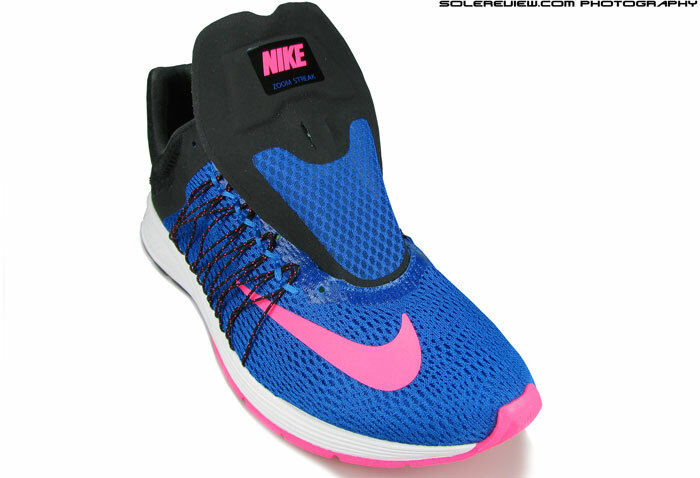 Similar to the Flyknit Racer in some ways, and has a different fit quality than the mesh Streak 6. If you thought that the upper was packed with new updates, wait till you hear about the midsole and outsole. Even a brief glance at the Streak 6 will tell you that there’s a lot of newness going on below the upper. The rocker-shaped midsole stands out, and visually clean sidewall matches the upper aesthetics. And the rocker shape isn’t an optical illusion; the Streak 6 does have a heel and toe spring higher than that of the Streak 5. Hello Skechers, you have company now. Underneath, the Streak 5’s external plastic shank has been relocated inside the shoe. The shank is visible as a color contrast (green in the picture here) under the midfoot, where the exposed midsole foam is. The Streak 6 is 8 grams or 0.3 ounces lighter than the 5. We believe that some of the weight loss is the result of decreased outsole rubber usage on the Streak 6. Under the front and rear, there’s less rubber and more foam instead. 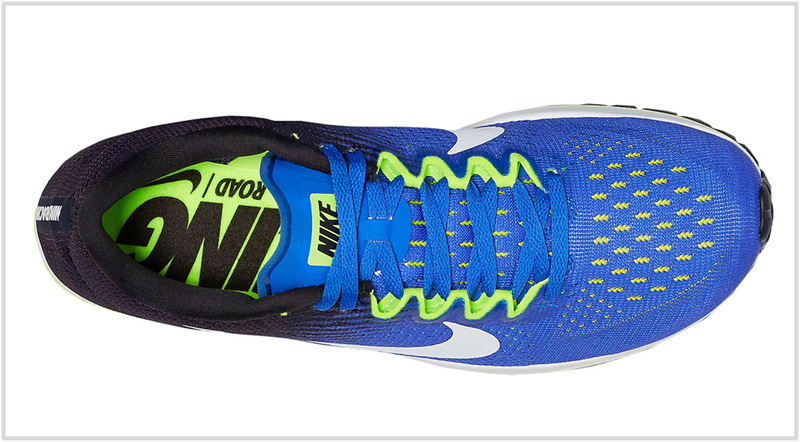 Speaking of more foam, the forefoot midsole splays out wider than the Streak 5. Whereas the Streak 5’s narrow upper was mounted on an equally narrow forefoot base, the Streak 6 broadens the midsole underneath. 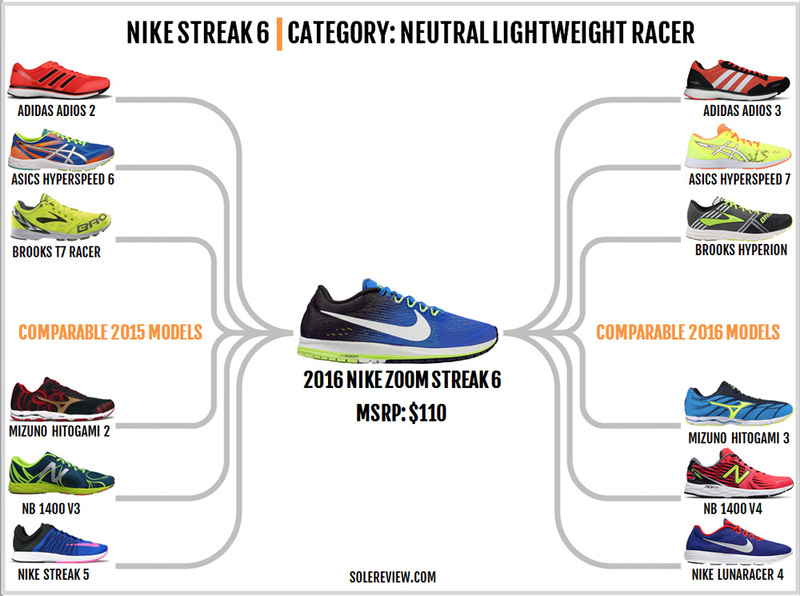 The life expectancy of semi-racing flats such as the Streak 6 is lower than traditional trainers with their bulked up uppers and outsoles. However, the general expectation is that the structural integrity of any shoe should degrade gradually over time and specific parts should not come to an abrupt end. The Zoom Streak 6 disappoints in that regard. The Streak 6 uses an engineered mesh which is half the thickness of regular meshes. While that works out very well for ventilation and weight reduction, the shoe’s durability takes a hit on the midfoot. Under the arch, four materials converge at a single point. The midsole edge (which is now firmer Phylon foam instead of Cushlon), the internal midfoot strap, the insole edge, and finally the thin upper mesh. Surprisingly, Nike has not strengthened this area by using a tightly knit mesh structure. Instead, the mesh has an open design and is of a flimsy build. 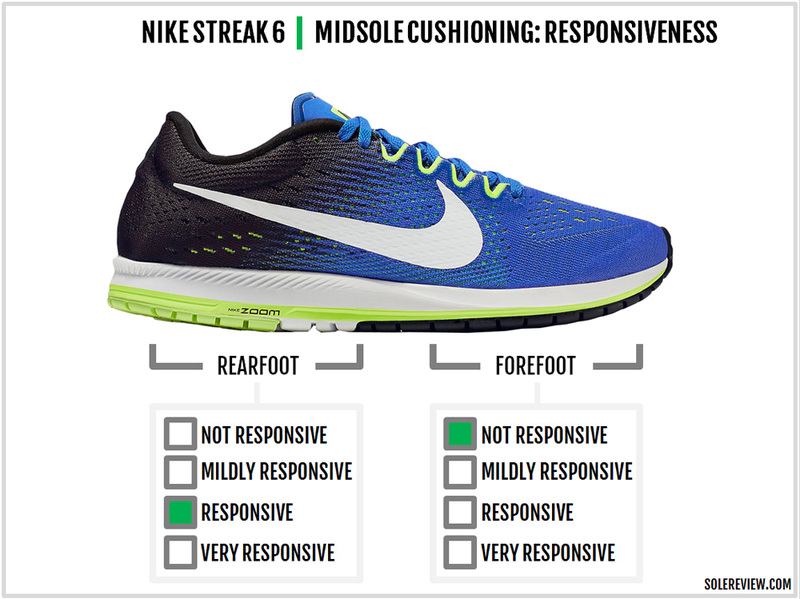 All would have gone well if the midsole waist was wide, but remember that the Streak 6 is a race shoe. That means that the midfoot area is narrow, and the foot somewhat hangs over the midsole edge. During motion, the foot overhang applies pressure over the midsole edge, which in turn applies frictional stress over the thin mesh. 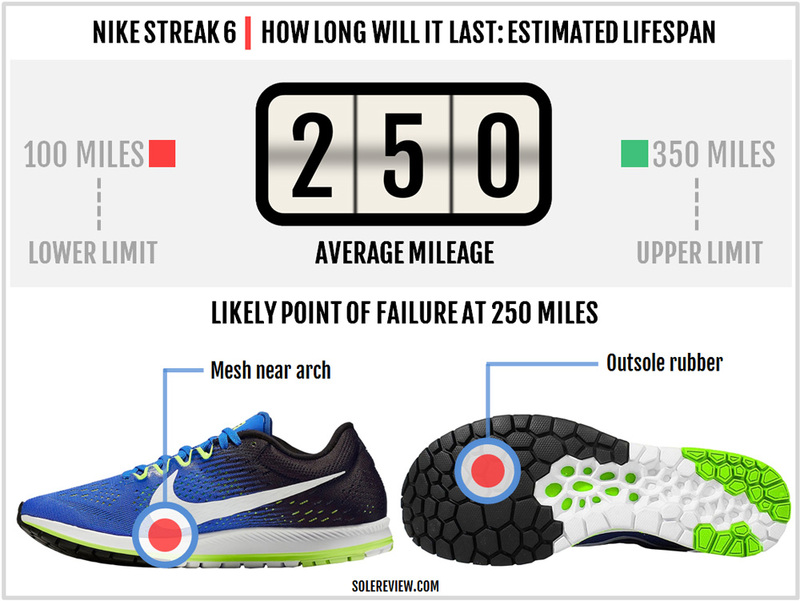 So don’t be surprised if the midfoot mesh develops a tear within a mere 150 mile usage period. If you get around 250 miles from the Streak 6, that isn’t so bad. If you’re very lucky (and also happen to be a light-footed runner), then 350 miles is a faint possibility. It’s a pity because the rest of the shoe has a decent build quality. There’s enough rubber on the outsole, and the firm midsole will hold its cushioning for a few hundred miles. Save the Streak 6 for the occasional race and track day, and you’ll be fine. An alternative would be the $160 Flyknit Streak, but then, a $50 up-charge over the standard Streak will test your credit card limit. 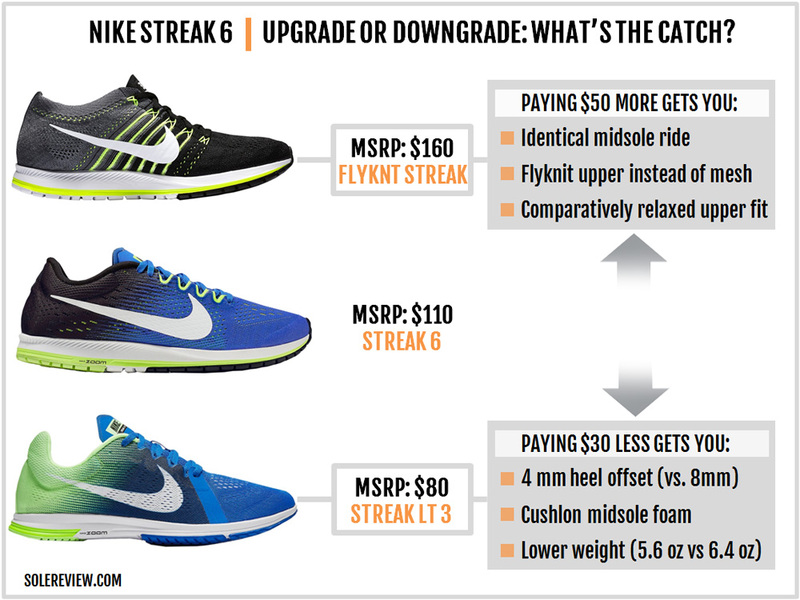 The Streak 6 still has a sloped forefoot, only less so than the Streak 5. The new upper raises the vertical toe-box height, so your foot doesn’t feel as pinned down. Substituting the external Flywire with internal strapping moves the midfoot fit pressure closer to the foot. In plain English, that means the upper has a better midfoot fit than the Streak 5. When you’re going fast, a secure midfoot is surely a virtue, and it is here that the Streak 6 shines. The wide panels distribute side fit pressure evenly, and on the top, the speed lacing loops apply top-down pressure in a more uniformly spread manner. 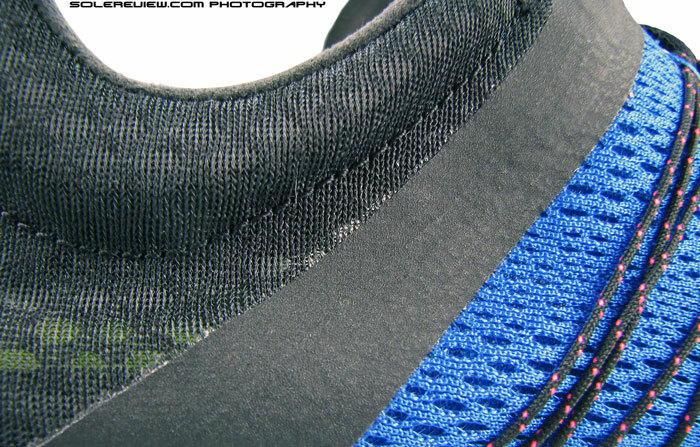 Compared to the round laces+eyelet combination of the Streak 5, the laces sits better and flush with the surface. If we had to nitpick, the Streak 6 laces could be a bit shorter. The heel collar is plush for a shoe of this category. 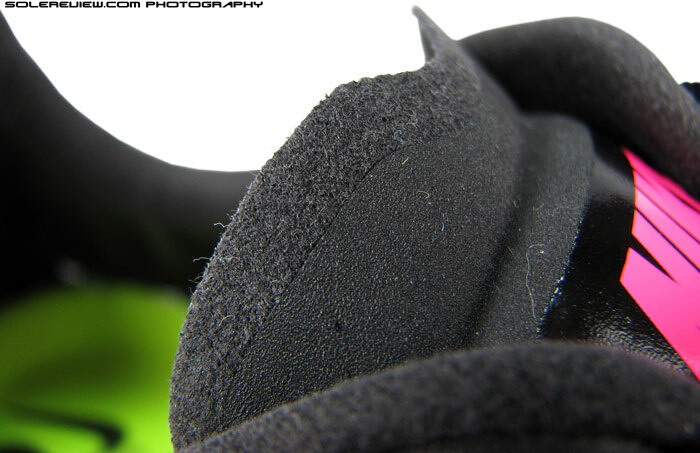 The lining used is soft, and there’s enough foam inside to result in a sufficient heel grip. And since the synthetic heel overlay of the Streak 5 has been eliminated, the Achilles dip is softer and more comfortable. The Streak 6 fits a half size small, as is the norm. Racing shoes are tighter than their daily training counterparts, so nothing surprising here. There are a couple of ways to deal with the Streak 6’s sizing dilemma. Unlike other shoes where there’ll be a straight answer for whether you need to size up or down, the Streak sizing depends on the usage. If you’re limiting the Streak to runs below 10k, then staying in the same, snug sizing is ok.
On the other hand, if you’re planning to run a half-marathon or beyond in the Streak 6, then buy half a size larger. Your foot will swell over longer distances, and a half upsize will feel welcome in the later stages of the race. The Streak 5’s forefoot and toe-box fit get a major upgrade in space. Replacing the very pointy, ballerina-esque toe box of the Streak 5 is a wider toe-box. Your toes no longer feel bunched together, and there’s room to wiggle them around. 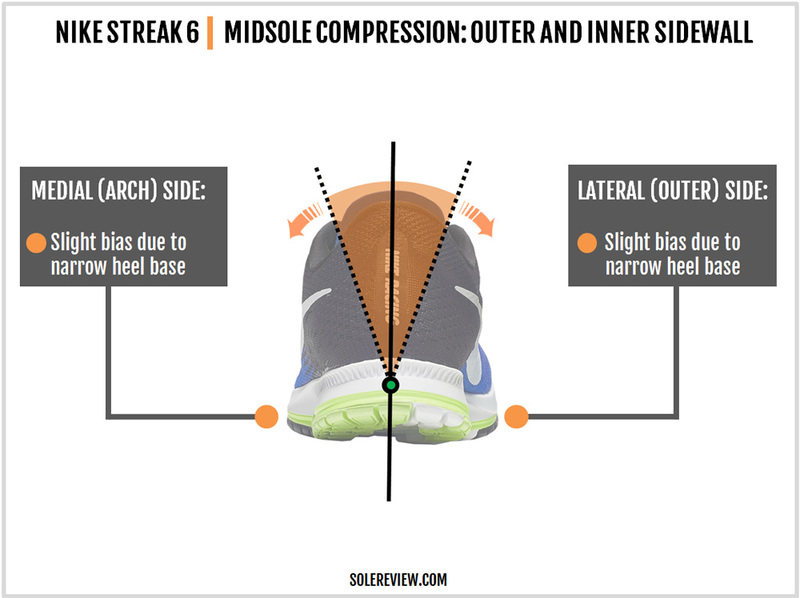 The forefoot is wider than the Streak 5. While it’s clearly due to the change of the shoe last, the choice of material helps too. The thin mesh allows greater foot splay, and the fact that the big Swoosh logo is moved away from the forefoot also eases the upper. 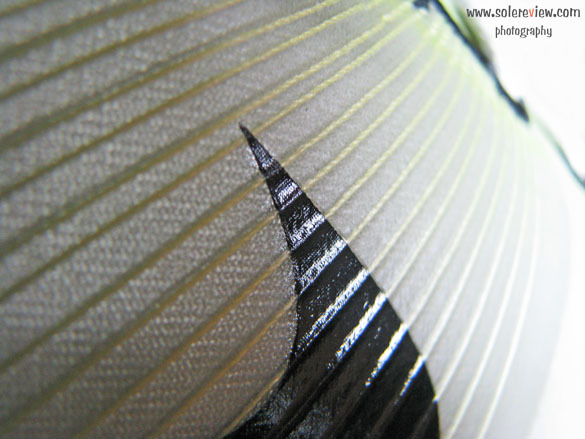 Also, the area between the lacing and forefoot is not laminated like the Streak 5. So the slight stiffness felt when flexing the Streak 5 disappears on the Streak 6. The increase in sideways upper space is also matched with a broader forefoot underneath, so that the Streak 6 doesn’t feel like one of those 4-E uppers which has the foot hanging over the edge. These updates make the Zoom Streak 5 one of the most spacious fitting racing shoes. The Streak 6 has an overall firm ride character. Sure, there’s a Zoom Air bag under the heel, but in its inert state, it is a firm component. 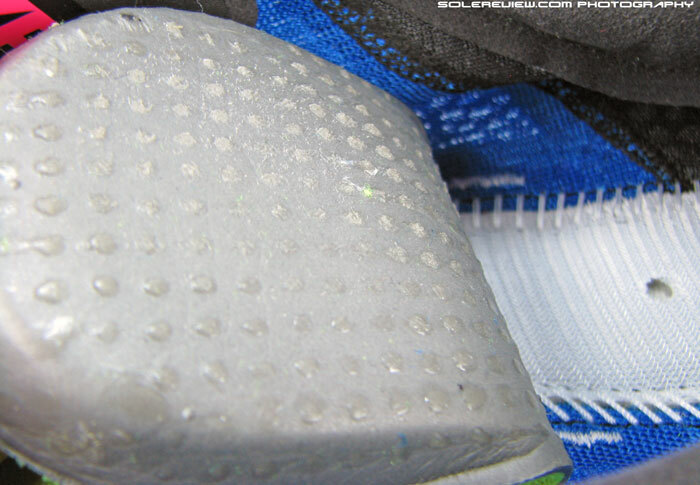 The glued insole provides some amount of softness, but then, it isn’t made of squishy blown foam either. Compared to the Streak 5, the midsole goes slightly firmer. We can think of three reasons why. First is that the midsole foam goes from Cushlon (softer) to Phylon (firmer), so the change in material affects the cushioning level. Secondly, the Streak 6’s outsole redesign reduces the cavity cushioning effect under the heel. 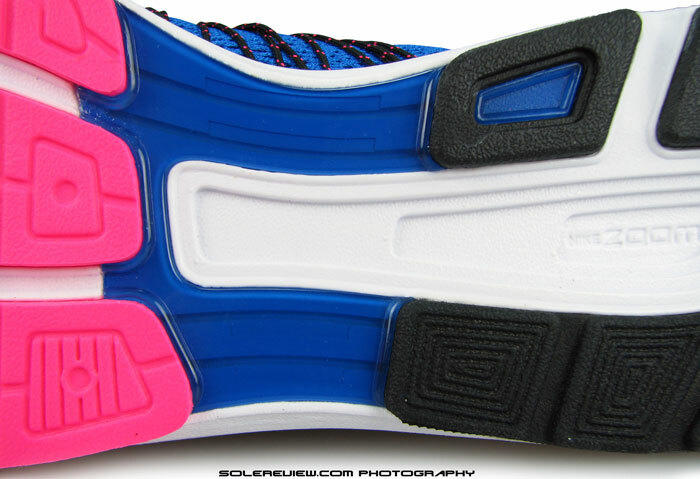 On the Streak 5, there was a hollow channel between the two outsole rubber pieces. In comparison, the Streak 6’s under heel is filled up with foam. This heel update mean that you get less of the trampolining effect. The forefoot design makes a difference too. There’s increased rubber coverage relative to the Streak 5; the latter’s forefoot had exposed strips of Cushlon foam between blown rubber slabs. Thirdly, keep in mind that the plastic shank moves inside the midsole instead of being fixed to the bottom. The result is increased firmness, of course. Yes, and one more thing. 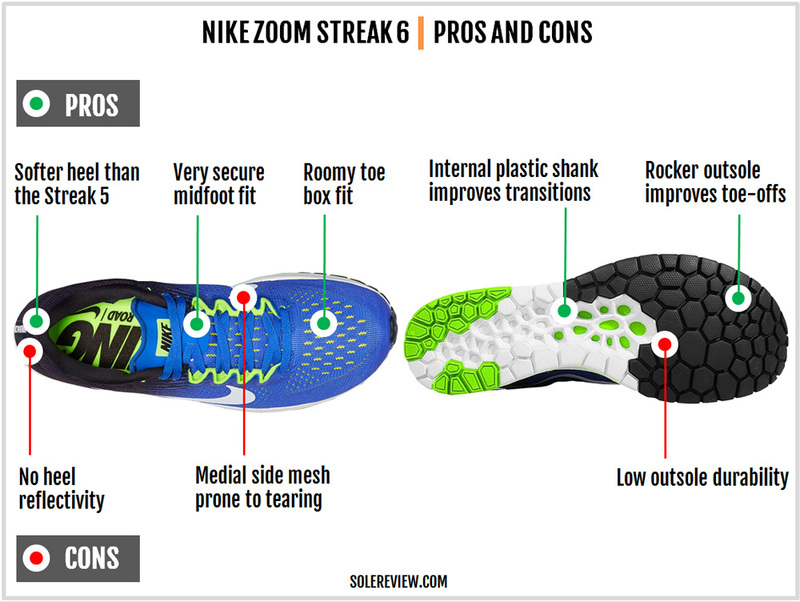 In our Streak 5 review, we complained of the squeaky noise coming from the somewhat-glued insole. That’s no longer an issue on the Streak 6, thanks to an insole which is glued tighter than before. Responsiveness is rearfoot loaded in the Streak 6’s case, which is entirely due to the heel Zoom Air bag. Even with the narrow heel footprint, the Zoom Air bag is of a sizeable thickness. Under the front, it’s all foam and outsole rubber, so the ride has a flat feel. On a related note, Nike has done a better job of integrating the Zoom Air bag into the heel midsole than the Streak 5. Perhaps it’s an effect of the firmer foam surrounding the Zoom Air unit, or it could simply be a matter of how the Zoom bag cavity is molded into the midsole. The Streak 6 feels a lot more planted under the forefoot than it does under the heel. The reason is very simple. 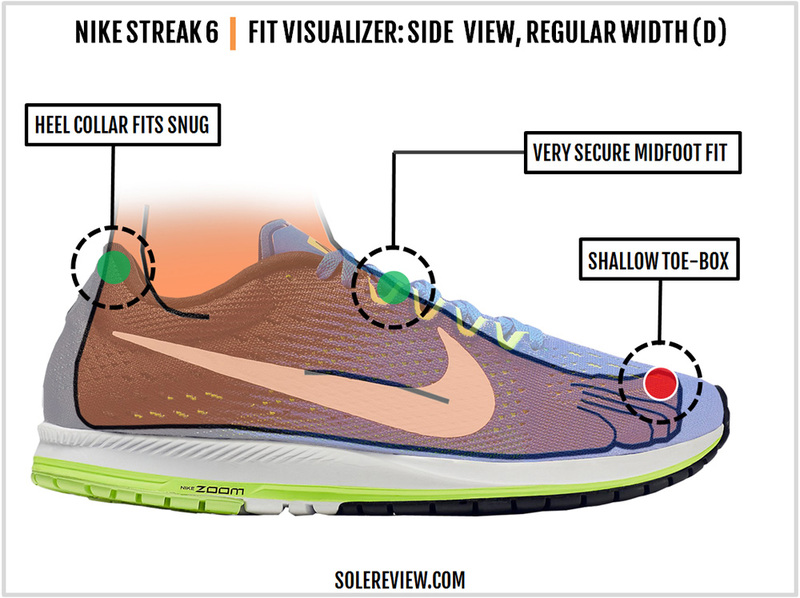 The forefoot midsole is much wider, and more so than the outgoing Streak 5. The heel has a very narrow base, so stability isn’t at par with what you’d expect from more built-up shoes. That said, the midsole stack isn’t sky high, and when combined with a firmer foam compound, the lower levels of support does not prove to be a problem. Besides, many runners using this shoe will likely forefoot strike. Towards the end of a long race, the footstrike might shift rearwards, but again, the stability issue isn’t significant to begin with. Another thing. 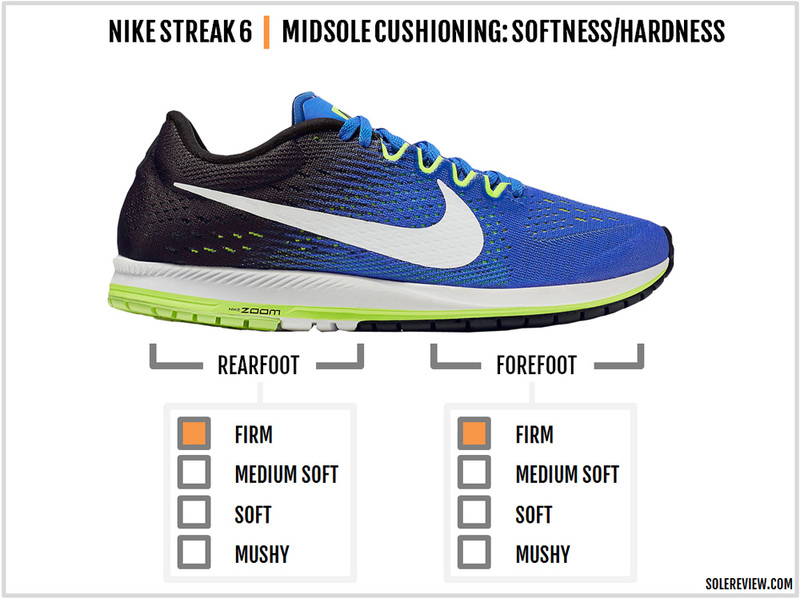 Since the Streak 6 had a very narrow midfoot waist, the midsole edges will press into your foot if you’re going slow. The longer your foot applies weight over the midfoot area, the higher the sensation of dig from the midsole edge. Go fast, and you’re all good. So no walking around in the Streak 6, please. As a fast shoe, the Streak 6 knows its business. Three things work together to deliver effortless transitions – the rocker shaped midsole, the internal plastic shank, and lastly, the firm ride quality. Nike adopting a rocker shaped midsole is not a very common occurrence. This design is commonly practiced by brands such as Skechers with its ‘M-strike,’ or by Hoka One One, the merchant of foam. Regardless, the rocker shape works in Skechers and Hoka, and it works on the Streak 6 too. Transitions, including push-offs, come quickly courtesy of the high midsole spring and a firmer foam material. 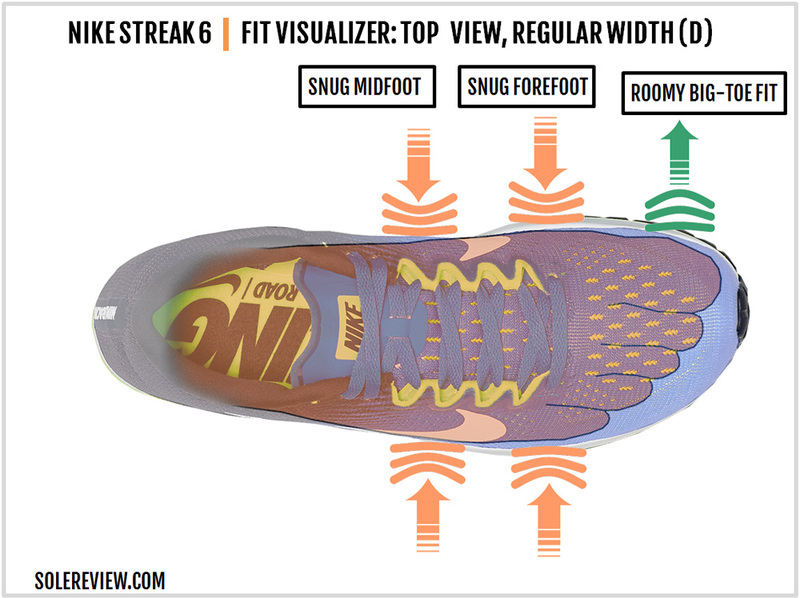 Also noteworthy is that the Streak 6’s forefoot has no particular flexing point. The forefoot lacks flex grooves, and in this case, the stiffness helps make the shoe faster. Less time in wasted in flexing, and hence quicker toe-offs. Not to be missed out is the role of the plastic shank. Having moved from the outside to inside, it does a better job of bridging the forefoot and rearfoot. There’s a better sense of connection throughout the Streak 6’s length, which is great. Unsurprisingly, the Streak 6 has a higher level of ground feel. It’s plain to see why; the closer-to-the-ground heel and the overall firmness of the midsole work together in concert. There are a lot of good things about the Streak 6. The increased forefoot room is a definite improvement, and the internal midfoot strapping provides a secure grip without the pressing sensation of the imperfect Flywire based lacing. The ultra thin mesh also makes the shoe very breezy to run in. Underneath, the firm midsole with its internal shank creates a base for quicker toe-offs. The heel cushioning is responsive, and the wider forefoot increases stability. All of that goodness is marred by the sub-par durability of the upper mesh. In what is clearly a design oversight, the mesh under the arch area is thin and is prone to tearing caused by friction. Among the smaller negatives, the laces are bit longer than what they need to be, and there’s no reflectivity on the Streak 6. In most reviews, we’d throw up this chart purely as an optional recommendation. But given the Streak 6’s fragile build, having at least one more shoe to rotate is a must have. As a same brand alternative, the Zoom Pegasus 33 is the ideal mile-sharing companion. The outsole is extremely durable, the midsole is cushioned with its front and rear Zoom bags, and the upper makes for comfortable accommodations. You get all this without the shoe sapping speed, and that’s always a good thing. Use the Pegasus 33 for daily use, and pull out the Streak 6 for faster time travel. 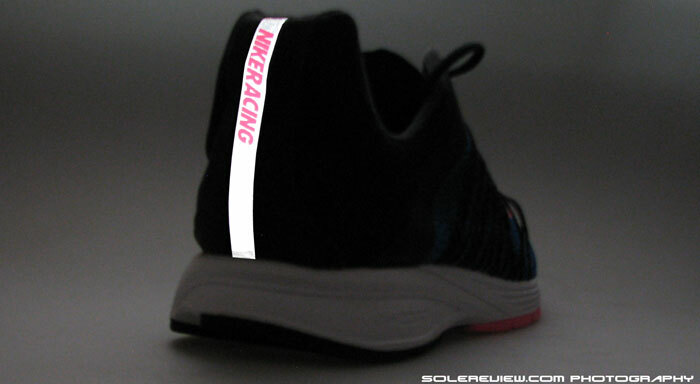 And in case you need another lightweight to run races in, but with more cushioning, then consider the Lunaracer. While we’ve recommended the 4th version because it is the current one, try and get the Lunaracer 3, which is a tried and tested model. The upper of the Lunaracer fits snugger in the forefoot and comes with a shallower toe-box than the Streak 6. When mixing and matching brands, the Saucony Ride 9 and the adidas Boston 6 come to mind. The Ride 9 is a close match to the Pegasus when it comes to the ‘fast’ ride character, and it is reasonably durable. The adidas Boston Boost is a perennial favorite for those who require cushioning without the burden of additional weight, and hence our pick. At this point of the review, you must have a pretty good idea of what’s new on the Streak 6. But no harm in a quick round-up, eh? The Streak 6 has a wider forefoot and toe-box than the Streak 5. And while the fit is focused on making the midfoot secure, the Streak 6 achieves that by using internal strapping vs. the Streak 5’s external Flywire. Below the upper is a firmed up midsole, thanks to the Streak 6’s use of a firmer midsole foam and integrating the plastic shank. And for that, Nike charges $10 extra over the Streak 5. You’re welcome. ‘Upgrade and downgrade’ doesn’t apply in the Streak 6’s situation. 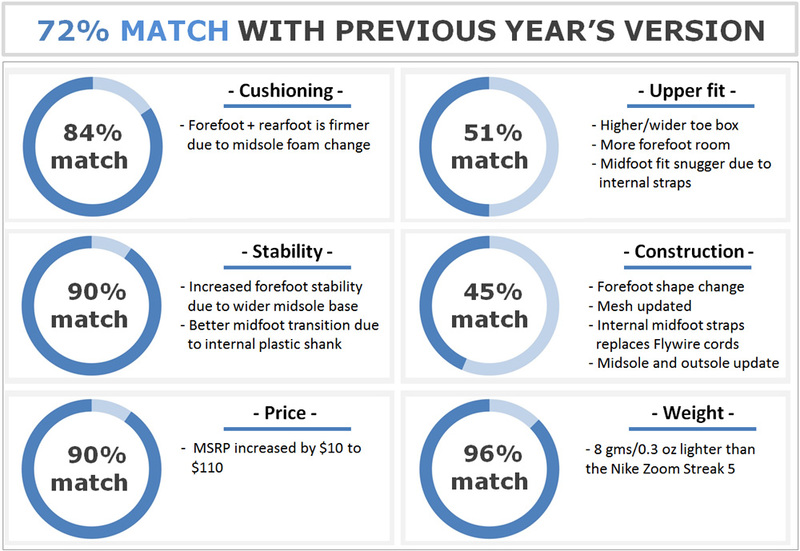 This is unlike the chart for a traditional neutral trainer, where more or less money usually translates into a respective increase or decrease in cushioning and material specs. We’ve included a couple of options here, but take this with a grain of salt. The alternatives are very different shoes instead of a simple tier-down or tier-up. At $160, Nike has the Flyknit Streak. This shoe has the same midsole as the Streak 6, except for a Flyknit upper. That makes the Flyknit version fit very differently than the mesh Streak 6. There’s more room inside the Flyknit Streak; call it a relaxed version of the mesh Streak. You can see that as an upside or downside depending on your use-case. Faster runs are better had in secure fitting uppers, which the regular Streak comes with. In that sense, the Flyknit Streak feels less secure; that might not be liked by runners who like their foot to be locked-down during races. The Flyknit Streak’s upper is more durable than the mesh upper, which means you’ll be spared of the fragile medial side mesh. At $80 is the lighter cousin of the Streak 6, the Streak LT3. It has a lower heel drop of 4 mm (vs. 8 mm) on a lower profile midsole. The way solereview sees it, the Streak LT3 is suited for shorter runs of 5K to 10k. Anything longer and the LT3’s thin cushioning might be an issue.